Thank you to troop 50502! 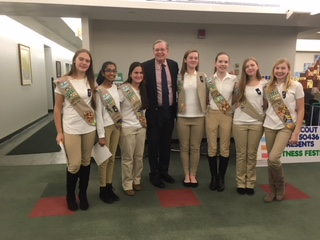 Congratulations to the Girl Scouts from Troop 50502 that were recently recognized with the Girl Scouts Silver Award for their fantastic work taking on the Bartlett Arboretum Butterfly Garden Project. The girls worked with Board member and Advanced Master Gardener Peter Russell to restore the Arboretum's Butterfly Garden as part of their Silver Award requirements. Working from May through September, the girls restored the garden to its original seven flower beds and pathways. Over the course of the project, the girls photographed plants as they came into bloom. They researched their scientific and common names, light and soil requirements, and whether they were deer resistant. To complete their project, the girls created a sign for the garden with images of the 11 different flower species they identified. They also created a brochure with information on each flower. Brochures are located in a holder below the Butterfly Garden Sign and are available to all Bartlett Arboretum visitors. The girls started the project on May 3 and finished on September 24. To receive this prestigious Girl Scout award they had to identify an issue that they cared about, build a team of members, pick a project, and then put a plan in place to get it done. When they first started working in the Garden, it was very overgrown and neglected. All of the plants were overcrowded, and there were many weeds and wineberry canes starting to grow. Together with Peter Russell, they worked hard to clear pathways, weed, and mulch the garden. They also took on different leadership roles to get the project done. While working in the garden, they identified and took pictures of all of the flowering plants. They then used the notes to make brochures and a sign that listed and described all of the flowers in the garden. There were many lessons learned, including learning about all of the flowers currently in the garden that help support pollinators and are attractive to lots of pollinators in our area like butterflies, moths, and bees. Thank you again to the the leadership team of Troop 50502 that created a new valuable education tool for the community. We hope you will visit the Butterfly Garden at the Bartlett Arboretum. It is located to the left of the Arboretum Greenhouse.